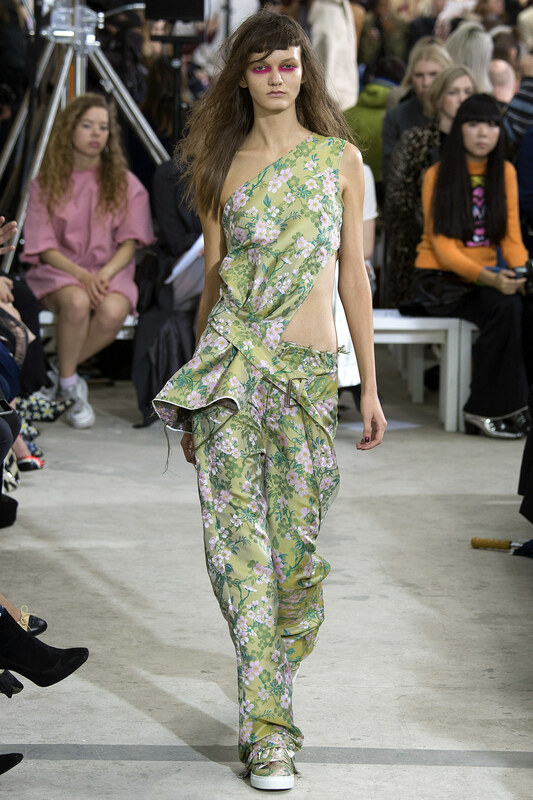 Along the lines of Simone Rocha, but with more of a street ethos, there is a diaphanous airy contingent with layered flowy silkens, a typically feminine attitude, but with enough sheer and naked to wander just beyond the bounds of decorum bordering the libertine. Of course with layers always the rage, one need not fret if they choose to be swathed in this ironic sweet grungery. Get out the underpinnings! 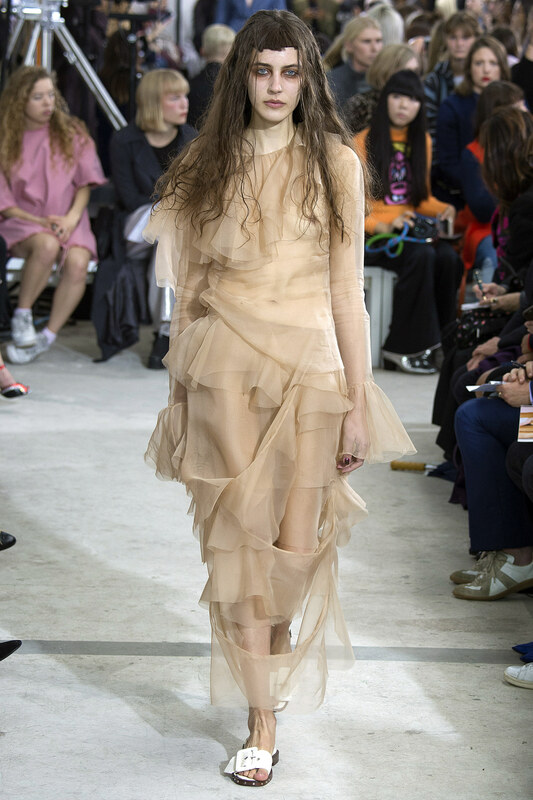 Hell, maybe just a fitted T. And then submerse yourself in the wanton exuberance that comes with pairing heaps of ruffles (I for one can never get enough) with anything you desire. Even better if it involves a leather ensemble. 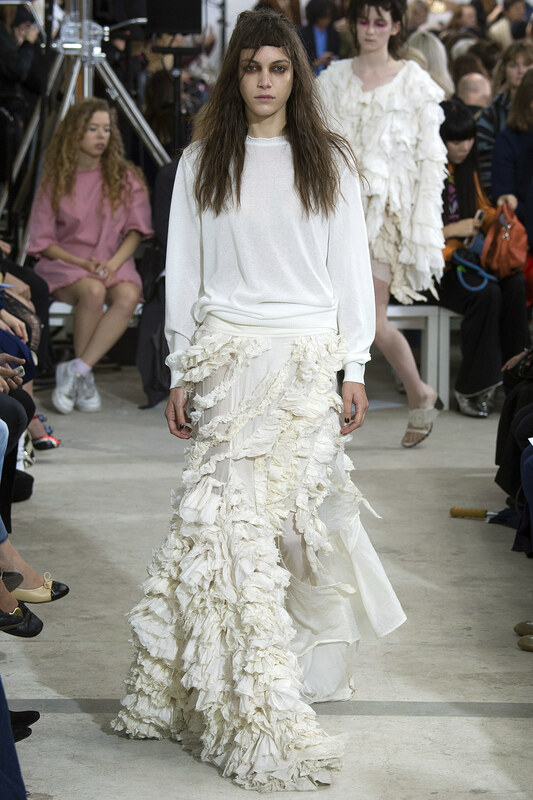 A perpetual charm in this wonderful collection was the heavy ruffle presence. Some folks love bangles, bows, and bugle beads, I LOVE a ruffle, can't get enough. 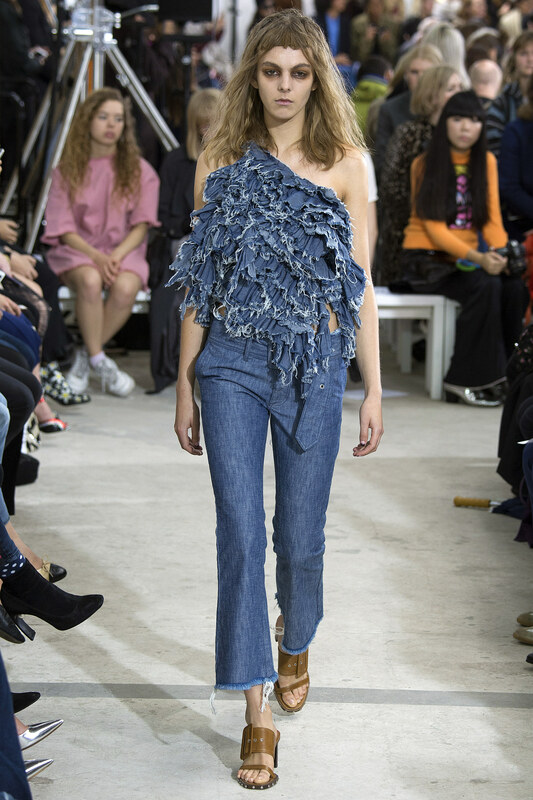 And happily, it appears that like all things 70's, the RUFFLE is hear to stay baby! Fun, flirty and theatrical, they can serve as the focal point, OR as an amusing adjunct. (Think ruffled blouse beneath a tailored suit a la Dolce & Gabbana). 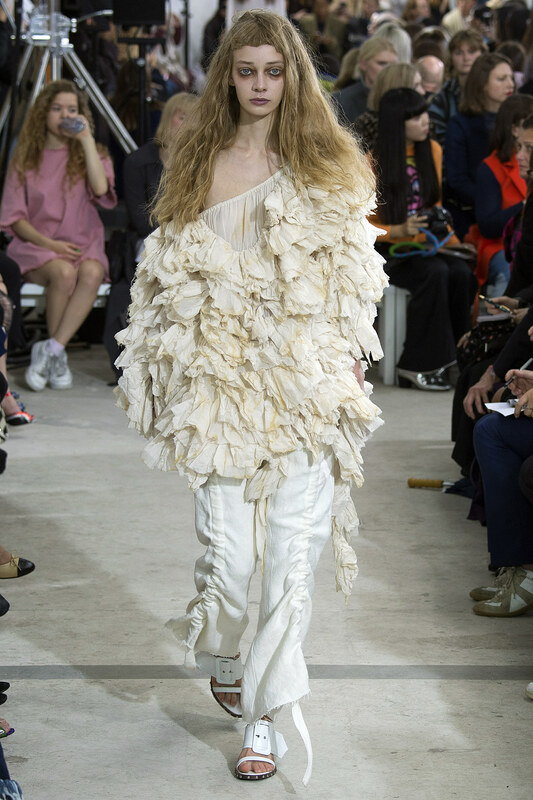 Here, the ruffles are served up in many a permutation to satisfy a host of sensibilities. 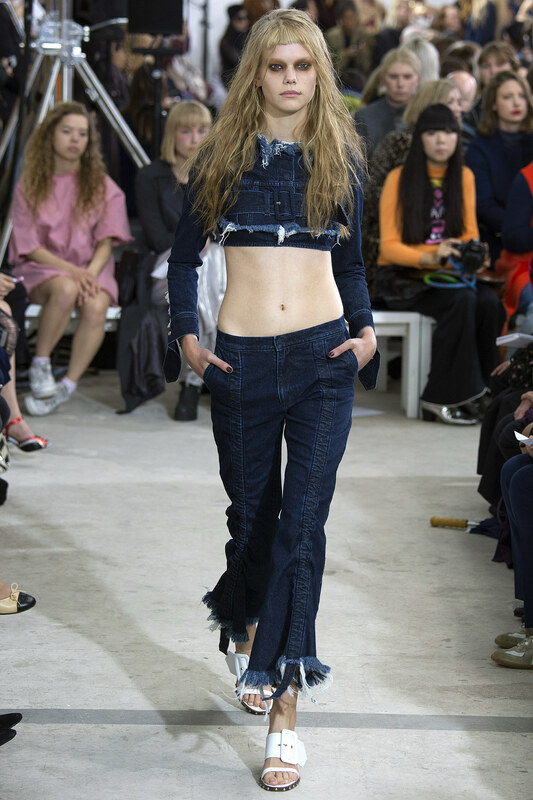 For the hip chick Mily Cyrus contingent, the midriff baring top and low rise pants duo in both denim and leather made an appearance, along with a few unfinished hems. 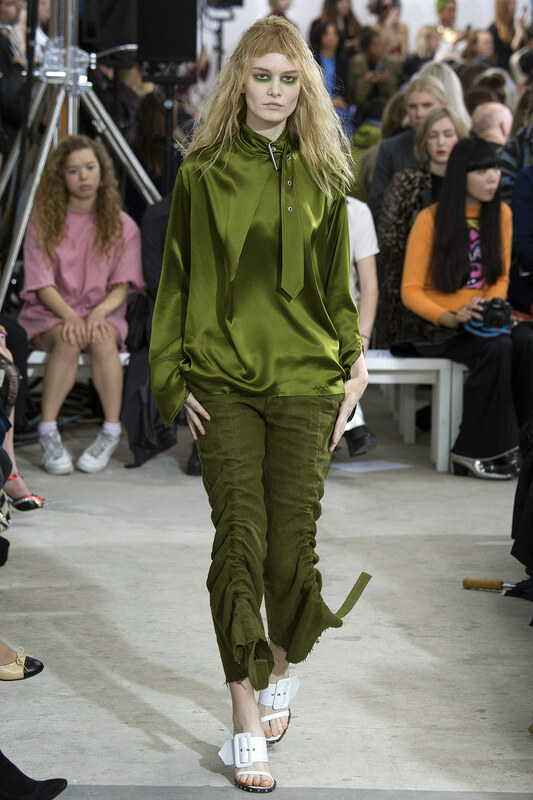 And peppered here and there were vibrant eye popping ensembles of RED, FUCHSIA, and moss green just to mix things up and illustrate a pleasing versatility. Garden pastels passed briefly through for the lovers of gardens. 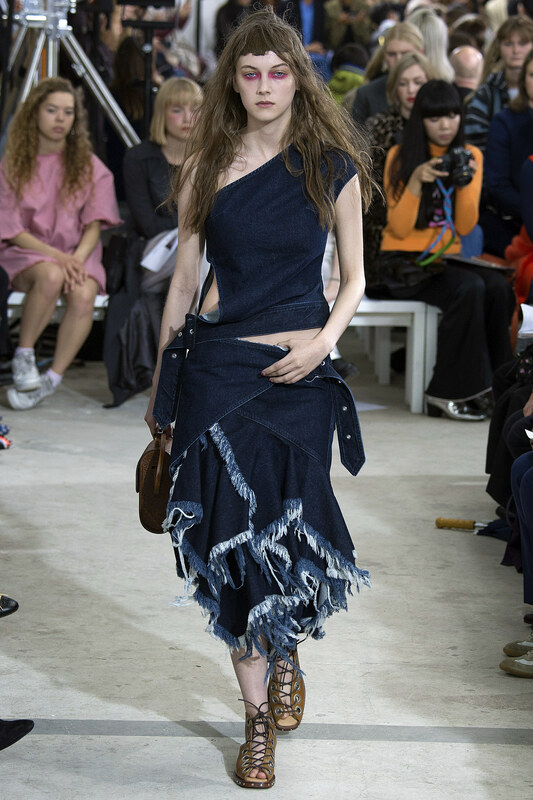 This singular and fresh collection also included a healthy dose of denim elevated beyond the usual by the unexpected silhouettes for the youngsters in the crowd, and a few elements for the rock n' roll biker chick brigade. Much territory is covered in a rather brief but memorable collection of intersecting themes, from the casual to the sublime, sure to impress varied fashionistas. Beautiful, ethereal entries for glamorous but casual beach evenings, or for the light hearted bride. Latter day Guinevere. Wear as a tunic over charmeuse palazzos or the bathing suit du jour. Keep the underpinnings in mind…..
H U Z Z A H! I have officially landed in fashion VALHALLA! 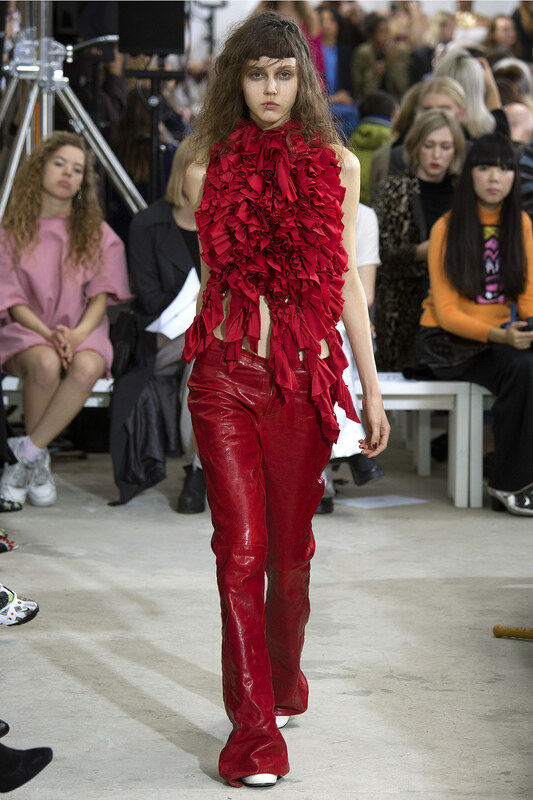 Red leather pants and a pile of tonal RUFFLES. You gotta be bold and brash to pull off the full on ROUGE. Pair the top with some white shorts, and of course espadrilles. And for the blazing red pants, just throw on your favorite T.
Soooooo dreamy……double fuchsia in competing silks forming a scrumptious and flattering ensemble sure to turn every head 360 degrees and then some. Perfect for a tony atmosphere, Monaco, the Hamptons, etc. I can imagine a Bond girl in this striking head turner. D e l e c t a b l e. Inviting. Alluring. Seafoam, a rare color from the Crayola box. Wear to a beach vacation, brunch on a yacht….crusing around Portofino. 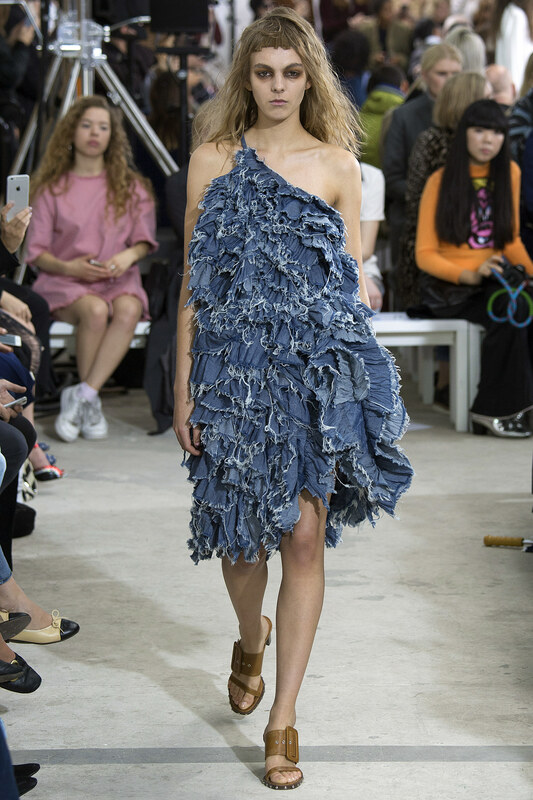 The asymmetric be-ruffled halter is a nice addition to the jean lexicon. Wear over a crisp white poplin shirt akin to a vest. And the fashion irony continues with the pairing of a sheer ruffle-oid barely there top with full on leather. 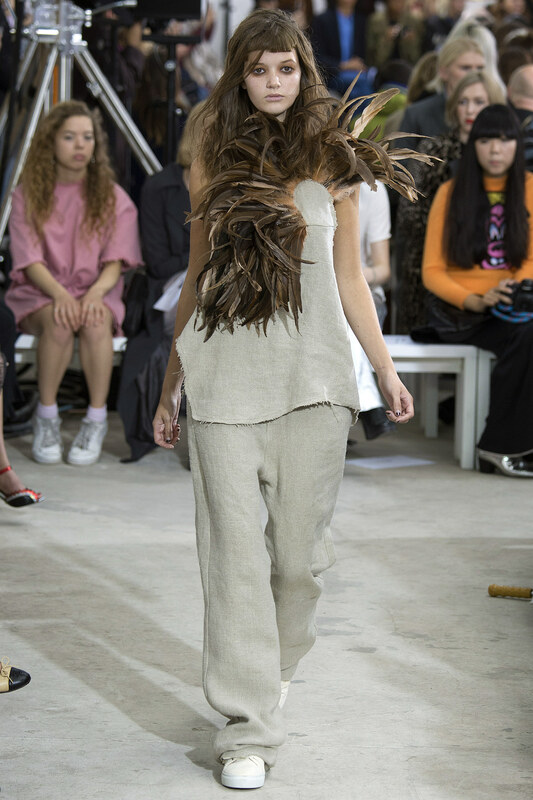 A kicky infusion of whimsy in the form of asymmetric feathers speak to the sense of humor in the house. Another in a series of kool casual pants just a bit off the beaten bath. Screams for some strappy sandals. The one I have to have, to throw over my skinny jeans. Buccaneer bravado. Get out the over-the-knee boots for good measure. Red carpet ready for the free thinker out there! 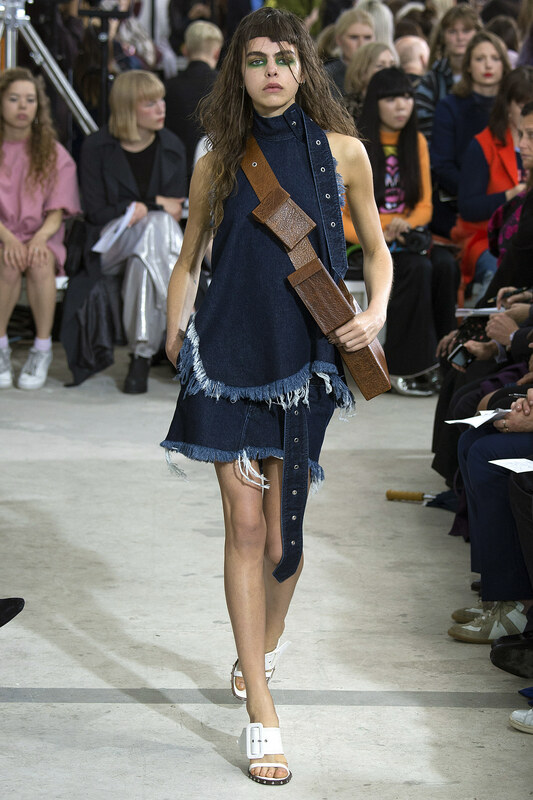 OR, for the hipster bride. Feminine, funky, and fabulous. All I can say at this point is, pick up these pieces now before the price point skyrockets, because these two are going to blast into some rarified atmosphere soon! And many kudos to my dear friend Eric who has scored an INTERNSHIP at this most hip of design houses!